1 How lovely is your dwelling place, Lord of heavenly forces! 2 My very being longs, even yearns, for the Lord’s courtyards. My heart and my body will rejoice out loud to the living God! 3 Yes, the sparrow too has found a home there; the swallow has found herself a nest where she can lay her young beside your altars, Lord of heavenly forces, my king, my God! 5 Those who put their strength in you are truly happy; pilgrimage is in their hearts. 6 As they pass through the Baca Valley, they make it a spring of water. Yes, the early rain covers it with blessings. 7 They go from strength to strength, until they see the supreme God in Zion. 9 Look at our shield, God; pay close attention to the face of your anointed one! 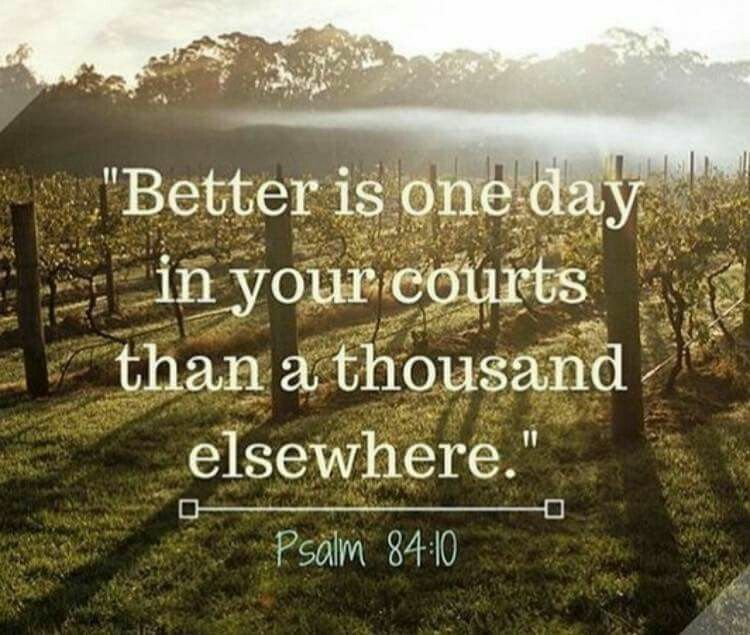 10 Better is a single day in your courtyards than a thousand days anywhere else! I would prefer to stand outside the entrance of my God’s house than live comfortably in the tents of the wicked! 11 The Lord is a sun and shield; God is favor and glory. The Lord gives - doesn’t withhold! - good things to those who walk with integrity. 12 Lord of heavenly forces, those who trust in you are truly happy! A. We’ll look at different translations of the first verse and then ponder this question: what and where is God’s dwelling place? 1. Note the word yedidot. This is generally translated as lovely, though the KJB translates it as amiable. Why is “lovely” better? 2. The word for dwelling place is mishcunotecha, which means tabernacles in Hebrew. What do we think of when we consider the idea of dwelling places of God? B. What do we make of the metaphor of the bird in verse 3? C. We’ll look closely at verses 5-7. These are complex but extremely important and beautiful verses. 1.Note again the use of the word ashrei, truly happy. It brings to mind Psalm 1. It’s as if the one who is truly happy is one who is near God, who lives with God, in God’s dwelling place. This is a person we see here as one who praises God constantly, puts strength in God, and undergoes a journey that is described in the following verses. 2.What is that journey, and who is on it? (There are so many possible explanations that come from the various versions in translation. One possibility to consider: Praiseworthy are the persons who on upward paths focus on their hearts (or those whose hearts and minds are focused on the pilgrim paths), those who pass through the valley of thorns and tears and transform it into a wellspring. What is the pilgrimage here? What might the upward paths be? The highways? What’s the Valley of Baka? What does it represent? (Some other translations: "valley of tears"; valley of thorns". Believed to be a very arid valley that pilgrims to Jerusalem passed through on their way to visit the temple. What is meant by transforming its springs? And blessings of rain or pools? And the meaning of verses 10-12? A day in God’s presence is better than all other days elsewhere. What could this mean? 1 Lord, you’ve been kind to your land; you’ve changed Jacob’s circumstances for the better. 3 You’ve stopped being furious; you’ve turned away from your burning anger. 4 You, the God who can save us, restore us! Stop being angry with us! 5 Will you be mad at us forever? Will you prolong your anger from one generation to the next? 6 Won’t you bring us back to life again so that your people can rejoice in you? 7 Show us your faithful love, Lord! Give us your salvation! 8 Let me hear what the Lord God says, because he speaks peace to his people and to his faithful ones. Don’t let them return to foolish ways. 9 God’s salvation is very close to those who honor him so that his glory can live in our land. 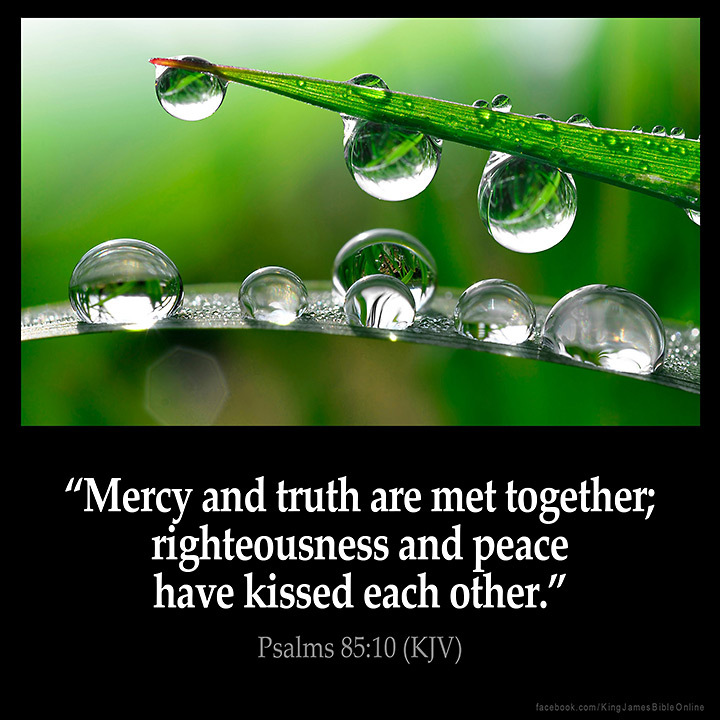 10 Faithful love and truth have met; righteousness and peace have kissed. 11 Truth springs up from the ground; righteousness gazes down from heaven. 12 Yes, the Lord gives what is good, and our land yields its produce. 13 Righteousness walks before God, making a road for his steps. A. This is a psalm about responding to distance from God that is created by our straying from God’s ways. How do we return? What’s the effect of doing so? What are the elements of the nearness that results from return? Look at verse 4. What does it mean? (It involves turning. It could be our turning back to God. We might do the turning and/or God might help us turn back. Or it could be our hope that God turns back to us. Or it might be both. One thing is clear: our salvation is very much caught up in our return, our restoration to nearness to God. B. Look at verses 10-13, some of the most beautiful verses in sacred or indeed any other literature. 1.What does it mean that loving-kindness and truth meet? 2. Then righteousness and peace kiss. Meaning? 3.We leave the psalm with a keen sense, especially in its last verse, of how important righteousness is to God. Righteousness is what gazes down from heaven; it is also what walks before God. 1 Lord, listen closely to me and answer me, because I am poor and in need. 2 Guard my life because I am faithful. Save your servant who trusts in you - you! My God! 3 Have mercy on me, Lord, because I cry out to you all day long. 5 because, my Lord, you are good and forgiving, full of faithful love for all those who cry out to you. 6 Listen closely to my prayer, Lord; pay close attention to the sound of my requests for mercy. 7 Whenever I am in trouble, I cry out to you, because you will answer me. 8 My Lord! There is no one like you among the gods! There is nothing that can compare to your works! 10 because you are awesome and a wonder-worker. You are God. Just you. 11 Teach me your way, Lord, so that I can walk in your truth. Make my heart focused only on honoring your name. 14 The arrogant rise up against me, God. A gang of violent people want me dead. They don’t give a thought for you. 15 But you, my Lord, are a God of compassion and mercy; you are very patient and full of faithful love. 16 Come back to me! Have mercy on me! Give your servant your strength; save this child of your servant! 17 Show me a sign of your goodness so that those who hate me will see it and be put to shame - show a sign that you, Lord, have helped me and comforted me. A. Look at verse 4 - Gladden the soul of your servant because to you, O Lord, do I lift it (my soul). What does this mean? (I offer up/dedicate/lift up my essence to You, God. You are my focus, my priority, the One whom I serve and to whom I submit. I pray. I worship. I offer up deeds of righteousness and loving-kindness that I do in the world in Your Name. In return, you gladden me at my core. Through the means of the soul, which guides me to serve You, you bless me. This has the feel of the Priestly Blessing. B. Look at verses 11 and 12. We seek to unite our hearts to focus on honoring God’s Name, to be wondrous of God’s Name, in allegiance, awe, and, yes, fear. This has the feel of the call and command of the great commandment, to love God with all our hearts, as verse 4 does as to loving God with all our souls. C. We leave this psalm with this idea of what it means to dwell with God: Home is where I offer up my soul to God and bring a united heart in allegiance. And there my soul is gladdened, God loves me, and I am delivered.